GPS sometimes makes me laugh, like when it pronounces the capital of Nebraska. I know Lincoln is quite a ways away from us here in the Panhandle (I categorized this as “things to do or see in surrounding states” for lack of a better category), but I think it fits within the scope of the blog. It’s our state capital, after all. Yes, this is a much, much, much delayed post. I visited Lincoln back in September. Here is what I enjoyed about the visit. I really, really miss living in a city with a big university campus. There are always so many interesting cultural events going on. 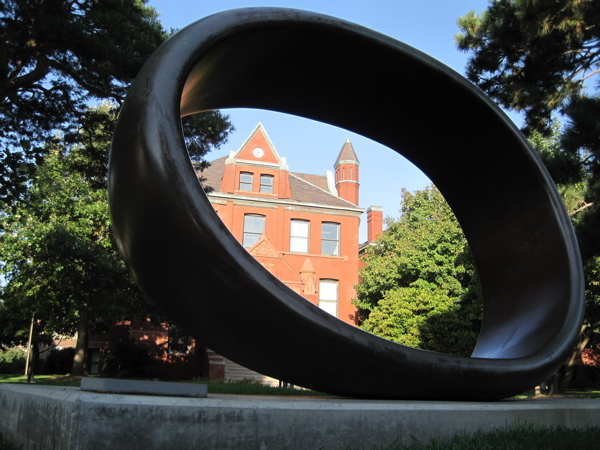 I got a kick out of the sculptures surrounding the Sheldon Museum of Art on the downtown campus. Especially when there was a mohawk-haired instructor (a TA, I assume?) enlightening a small group of students about this or that artist. There were students camped out everywhere around the museum that day, sketching or doing homework. Yes, we have some excellent museums here in the Panhandle, but it’s always great to be able to visit new ones. 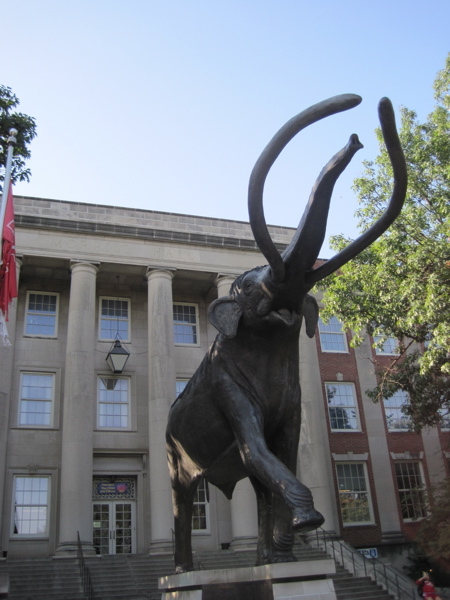 I was really impressed by the mammoth / elephant display in the State Museum. I had no idea there had been so many different permutations of the pachyderm kind. Of course, there was the whole Husker game experience on the UNL campus, too. There was good shopping and, more importantly to me, good dining. 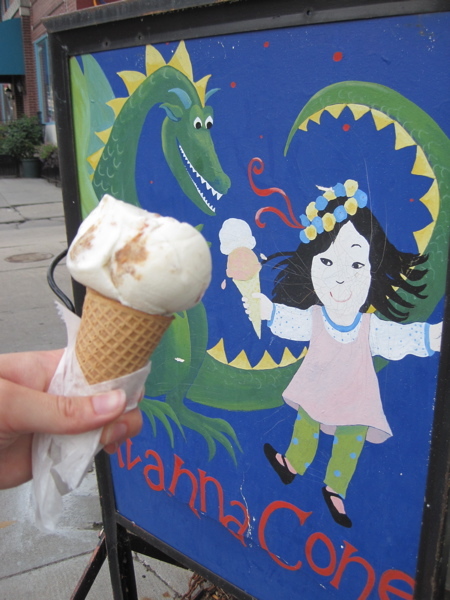 Small-batch ice cream at Ivanna Cone. Did you know that dragons like ice cream? 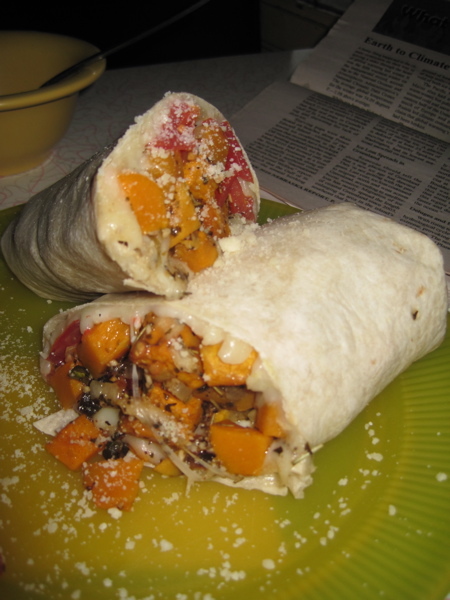 I am not a vegetarian, but I like to eat at vegetarian restaurants because they tend to do such lovely things with veggies and herbs/spices and cheese. Ohmygosh, I’m hungry! Gotta keep going on the food theme here. I love trying international foods, so Lincoln was a gustatory playground for me compared to the Panhandle. I enjoyed The Parthenon. I love Indian food, so of course we went to The Oven. And Thai food? 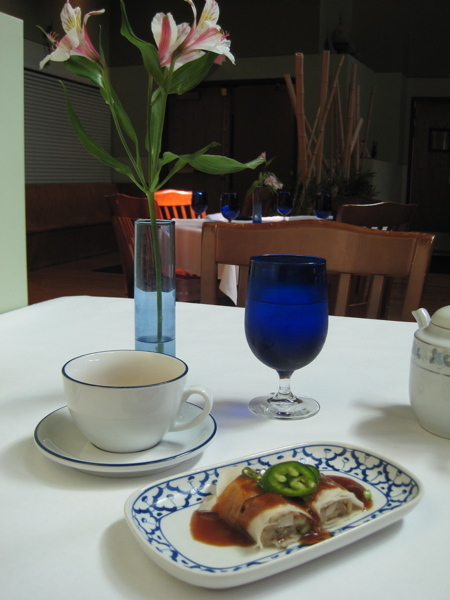 The Blue Orchid rates an “uummm nummy!” even though they didn’t have papaya salad. Such a classy place, that Blue Orchid! Awlawlaw . 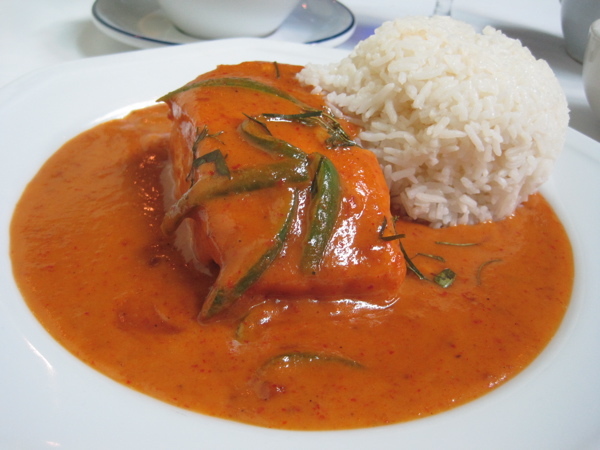 . . salmon curry . . . drooling . . .
Oh, and there were new brews to check out, too, that I haven’t seen on this end of the state. 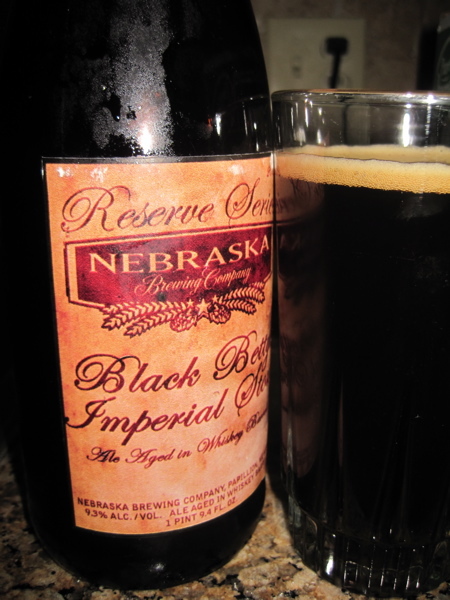 We splurged on this very expensive, very wonderfully complex bottle of Black Betty. OK . . . random silly picture . . . 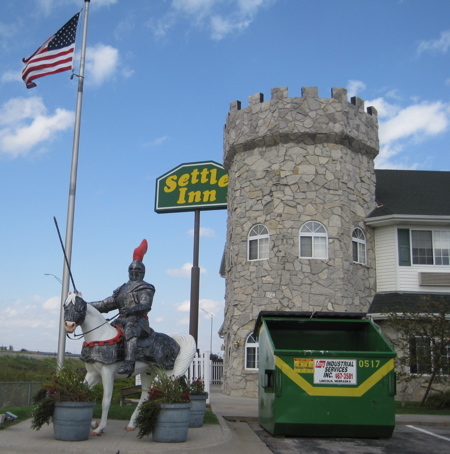 I, Sir Putrescence, knight in aluminum armor, shall guard this dumpster with my life! 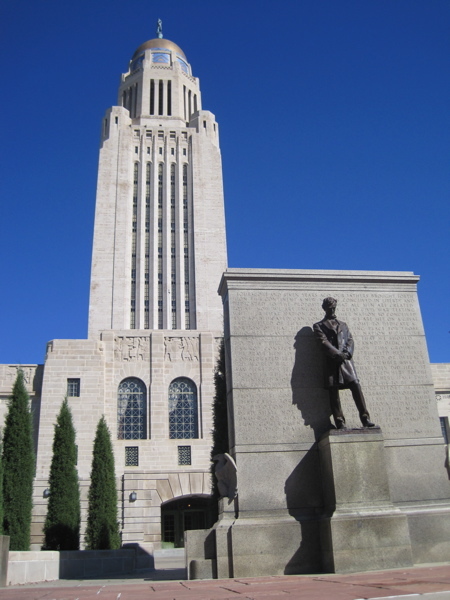 And then there’s the state capitol building, that towering cathedral of Art Deco scrumptiousness that shall get a post of its own. Yes, Lincoln was fabulous to visit, but I’m not sure I would want to move there from here. There’s more crime and traffic in Lincoln, and so many places to eat and shop, it would quickly outstrip my household budget, I’m sure. I’d also miss the wide-open spaces, varied terrain and western ethos of the Panhandle. No place else like it. Though I have a copy of “Hitchhiker’s Guide” on my bookshelf, I’ve not yet read it. I hung out with some folks in college who were big fans, and I did read a comic book version of it. Eek! You have not read the books? It does take a silly mindset. I admit to having read the trilogy at least a dozen times, and if someone approaches me with ‘I have a question’, ’42’ immediately pops into my brain. I have managed to suppress voicing it. 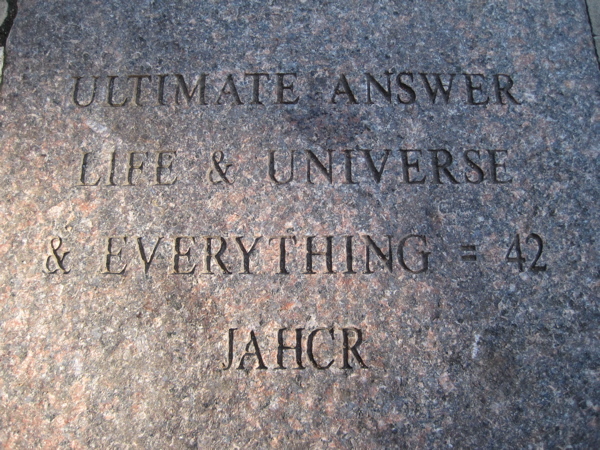 It’s pretty cool to see it in stone. I’ve only been to Lincoln twice, and each time we did not stay long. The museum looks good. I’ve been trying for years to figure out if I should try to be more like Ford Fairlane or less like Ford Fairlane. It’s a hard and terribly unimportant decision. I never made it to Lincoln. Well, I drove through it on my way to Homestead National Monument of America. I have rarely explored much in eastern Nebraska. I tend to travel to large mountians or large lakes. Fort Niobrara has a lot to offer. Their website doesn’t do them justice.